After reading them the riot act, Sandy takes a job staging a boutique hotel in Atlanta recently acquired by her best friend’s boyfriend. The good news is that she can spend time with her recently married daughter, Shannon, in Atlanta. The bad news is that Shannon finds herself heading to Boston for job training, leaving Sandy and her southern son-in-law, Chance, as reluctant roommates. If that’s not complicated enough, Sandy begins to suspect that her best friend’s boyfriend may be seeing another woman on the side. I really enjoyed Best Staged Plans. It was easy to read with warm characters, snappy dialogue and a story line I found interesting and somehow relatable, even without having any knowledge or experience with empty nest syndrome. I loved Sandy’s character. She was warm and funny and never takes herself too seriously, which always leads to humorous situations. Even with not being a huge fan of TV design shows, I found her career interesting and liked the home decorating tips described along the way. Sandy’s worries and frustrations felt real and her nagging had images of my own mother floating through my head and caused a few giggles along with cringes. I was surprised at how much of my own childhood this novel brought back as Sandy travelled down memory lane with her own kids, which put numerous smiles on my face. I did find certain memories of her and her best friend’s childhood confusing and I had to stop and wonder about their ages because I had similar experiences with my friends such as the mood rings and magic eight ball, but maybe these things just get recycled over time. Unfortunately it did jolt me out of the story a couple of times though. I loved all the relationships she had from her husband and children to her best friend and found them warm and loving even when there were kinks along the way and I rooted for Sandy to work her way through her worries. Some of the scenes where she was reminiscing with her husband about the first years of their marriage and their children’s antics growing up were so tender and warm that it tugged at my heart strings when she felt underappreciated and aggravated. 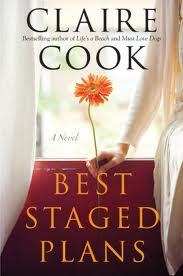 I thought Cook portrayed the love and frustration that can occur in a relationship perfectly. The dialogue in this novel sparkled and popped and the writer in me studied every line. It didn’t matter who was speaking or who they were speaking to, witty dialogue peppered this novel. Full of heart and humour, you’ll devour Best Staged Plans. It’s the perfect summer beach read.